Fruit Share Steinbach's Stainless Steel Cider Press! Apple cider is a great drink for summer! It's refreshing on a hot day, it's healthy and nutritious, and it's completely affordable to make! With our stainless steel cider press, gallons of apples can be pressed in minutes. You can walk away with cider made completely with your own apples; no water, or preservatives added! You can easily can or freeze your cider to make it last throughout the year. It's a great way to use up crab apples too! Fresh cider made from crab apples is delicious! 1) Pick all your own apples and bring them to one of our Pressing Days and then help press your apples into fresh cider. Bring your own containers to bring your juice home. This option is open to Fruit Share Steinbach paid members ($10 annual fee.) Become a member here. Email us to find out when our next Cider Press Day is. 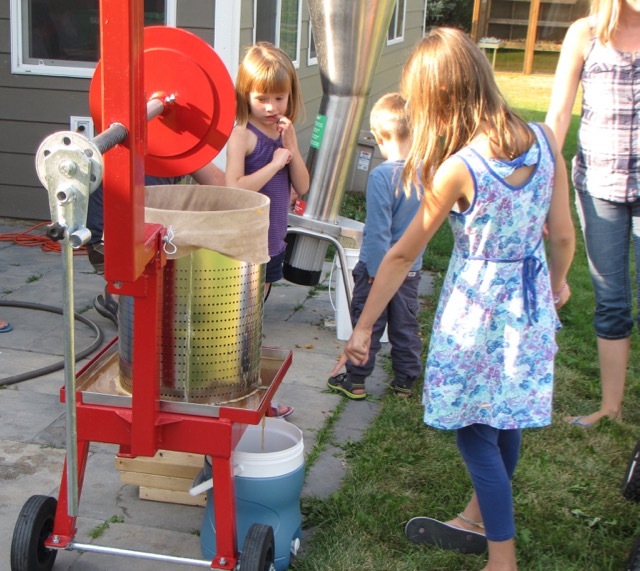 2) Schedule an Apple Press Pick where our members come to your house and help you pick and press your apples. Cider is shared three ways: you take 1/3, the member pickers take 1/3, and 1/3 is donated to a Community organization. Homeowners don't need to be paid members for this option. Register and Schedule and Pick here. You pick the apples at an apple pick, then the apples go into the crusher, then they get pressed in the stainless steel press. The juice from the apple flows out of a spigot into a container. The apple cider must be refrigerated and enjoyed within the week. Fresh cider can also be frozen or canned. Here are some tips on how to enjoy unpasteurized, freshly pressed cider.